Between 2014 and 2017, the percentage of people in the developing world who have accounts with financial institutions or mobile money providers but do not use them has grown from 12% to 13%. What this tells us is that usage of financial products is not keeping up with access. These hundreds of millions of dormant accounts are not useful or beneficial to the people that they are meant to serve, and neither are they good business for financial service providers (FSPs). It is clear that the financial inclusion industry must do a better job of designing and delivering products that people and small businesses really need to thrive. Technology is transforming the way that customers interact with their financial services. Many of today’s customers have computers in the palm of their hand and are connected to sources of information to which they did not have access. This makes them more informed and selective and gives them higher expectations with regards to speed, convenience, and service. Technology is also enabling FSPs to reach new segments of underserved markets, which have more nuanced needs than just standard credit and saving products, such as nano-credit products and financial planning tools. Technology allows products to be customized and responsive to customer behavior, providing customers with concrete value. Technology has improved and accelerated the way customers access and receive information but has also presented new risks for the client, including overindebtedness, aggressive digital collections, and even financial exclusion in some cases. Providers must take a nuanced approach when integrating technology into their products for each of their customer segments, providing education on how financial products can help them achieve their life goals, how to make the best use of the product, and how to use each channel available to them. Tracking and evaluating the product’s performance in the market. Accion’s user-centric design methodology draws constant inspiration from listening to and observing people in their daily lives, works within market and technological constraints, and considers every product touchpoint an opportunity to surprise, delight, and deliver benefits to users. When done well, this approach fuels the creation of products that resonate deeply with an audience, ultimately driving engagement and growth. Rapid prototyping and real-world tests with customers are used to quickly validate (or invalidate) early designs and iteratively improve the final product. Accion has provided new product development support to institutions in Latin America, Africa, and Asia for many years. We have helped institutions to successfully develop, deploy, and improve a variety of user-centric financial products and services, including group and individual lending, savings, insurance, and housing products. One of the ways Accion helps FSPs develop user-centric products is by conducting design workshops that help institutions develop new product ideas. Between 2017 and 2018, Accion held design workshops with 30 institutions in Mexico, Chile, Colombia, Zambia, Tanzania, and Sierra Leone. During the workshops, participants begin by assessing their primary business challenge, and reframe it from a user-centric angle rather than an institution-centric one. 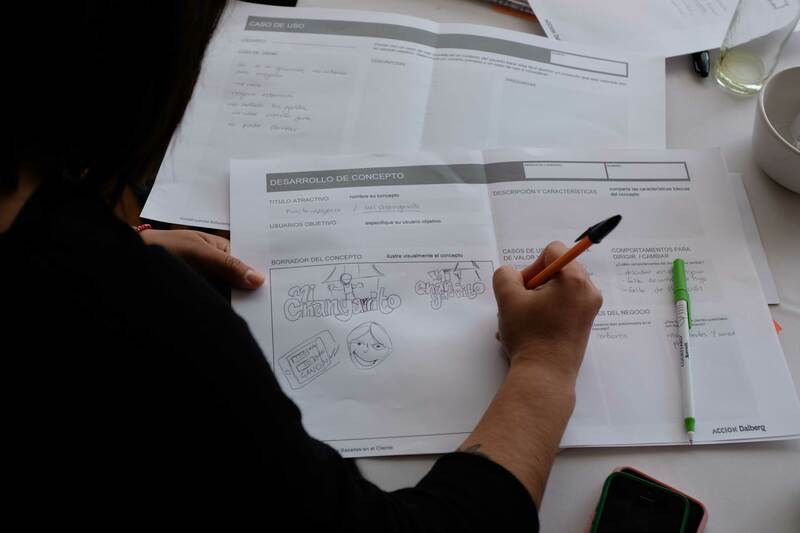 They then learn how to conduct efficient and useful user research, and use their understanding of their customer’s financial behaviors, capabilities, needs, and desires to ideate and prototype a new product concept. They test their initial prototypes with potential users, and iterate based on user testing. FSPs have learned how Accion’s product development methodology supports the development of user-centric digital products and services by focusing on understanding customer wants, needs, and behaviors, as well as building financial capability, all while considering institutional strategy and capacity. FSPs have applied the methodology to identify, develop, and prototype a product or service concept that addressed a real-life challenge or opportunity. FSPs have learned how the methodology can be best adapted to their needs, context, and market, and how to build an initial business rationale for product development or improvement. FSPs have left the workshops equipped to apply the methodology inside their institutions through a customized product idea, prototype, and implementation plan (including a user-centric pitch). 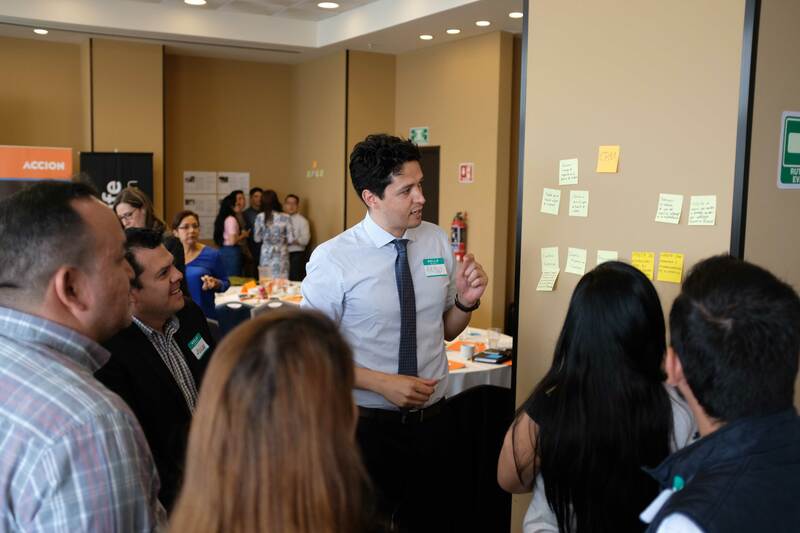 Accion held a two-day workshop in Mexico as part of a global partnership with MetLife Foundation. The workshop, “Building Client-Centric Solutions,” brought together financial service providers, including microfinance organizations, cooperatives, and fintechs, to design and develop user-centric products and services based on a deep understanding of customers’ behavior and a focused effort to build financial capabilities. The workshop provided the participants with a variety of tools to support the development of new or improvement of existing digital products. Even though participants leave the workshop equipped to apply the methodology inside their own institutions, they know the path ahead will not be easy. Many of them tell us that they expect challenges with culture change and implementation when they return to their institutions. Accion therefore also helps institutions build multi-disciplinary product development teams that gain institutional buy-in to build a culture of user-centricity, and supports them through every step of the implementation process. Once prototypes are built, institutions translate the findings and recommendations collected from customers into a minimum viable product that can be piloted and tested with a subset of end users. Meanwhile, Accion works with institutions to prepare internal teams and systems, as well as external partners, for launch and product rollout. Accion provides the tools needed to continually monitor the product and create the regular user feedback loops to identify opportunities for product improvement to ensure that the product is successful in the market. In an effort to motivate greater saving among their client base, Bancompartir and a team from Accion sought to provide Bancompartir’s clients with an alternative to informal savings mechanisms and to address the distrust of financial institutions. After conducting extensive client-centric qualitative and quantitative market research, the team prototyped a product that integrates savings into a working capital loan. The customer sets a savings goal that is achieved through reoccurring deposits with are combined with each loan payment. To incentivize customers to save, the higher the savings goal the greater the discounted interest rate on the loan becomes. The product, el Milagroso, has now been on the market for six years in Colombia, and over 100,000 accounts have been opened with total balances exceeding $1.3 million USD.